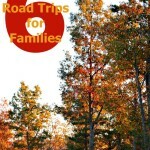 Home » Reviews » Apps » Fall getaways: Why let summer have all the fun? This is a sponsored post based on my personal experience with Ibotta. All opinions are mine. 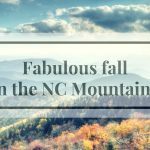 With fall travel season just around the corner and the stunning North Carolina mountains just a few hours away, I am saving up for a weekend getaway to a mountain cabin. My son requested a trip to the mountains a few years ago, and we have not yet done it. Fall is “prime season” in the mountains. Apparently, lots of people want to see the trees show off their glorious red and gold display every fall. 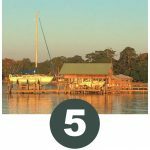 Fall is also a great time to catch one last bit of summer with a beach getaway. The sun still bakes the sand during the day, but cooler evenings create a cozy ambiance welcoming sweaters and dinner by a warm fire. 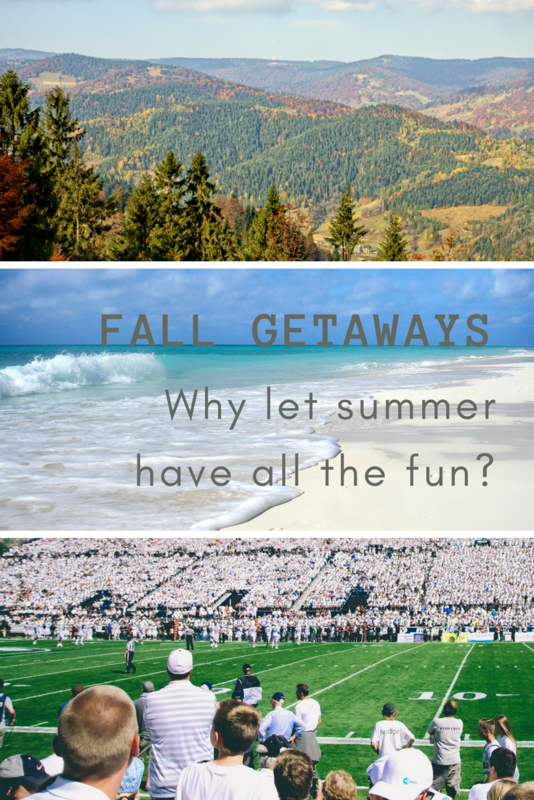 And, if you’re like our family, fall is also college football season and that means travel, tailgating, and hopefully a win for the home team! So, whether you’re trying to hold on to summer or embracing fall for its own wonder, you need money to pay for it! Right? And that’s where Ibotta comes in. To be honest, I had heard about Ibotta from friends, but I never tried it. What a mistake! So many places I shop — and even travel brands I use — are Ibotta partners, so I could have been earning cash back on things I’m already doing. GAH! ONE: It’s easy to earn cash back while doing my everyday shopping! We stock up on the basics at Walmart since it’s conveniently close to home — or just about anywhere we go. So I used Ibotta there for the first time. 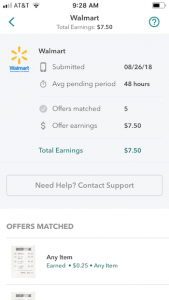 I downloaded the free Ibotta app, followed the easy on screen guidelines and added cash back offers from Walmart that matched our grocery list. True confession — I also activated the Talenti gelato cash back offer — my favorite late night indulgence! Then, I headed to the store and shopped as usual. Once I got home, I scanned the QR code at the bottom of my Walmart receipt with the Ibotta app and that was it. Doing my regular, everyday shopping, I got $7.50 cash back on one shopping trip buying things I was going to buy anyway! In ten days, I earned $27.25 from my regular, everyday shopping thanks to a $10 bonus for earning $10 in shopping savings. That’s amazing! The Ibotta app offers cash back through several booking sites: Booking.com, Hotels.com and Hotel Tonight (all of which I use from time to time). Since my son wants to go to the mountains in fall, I searched for a condo in Boone, NC using the hotels.com app. At the time of booking, the app offered 6% cash back on our stay. I chose the Chetola Premier Condominiums in Blowing Rock for our escape. 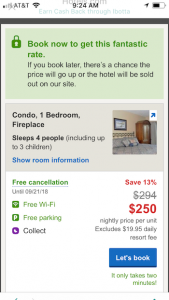 The accommodations were discounted 13% on Hotels.com and I got 6% cash back with Ibotta. Awesome! The Ibotta offer alone was $30, enough to pay the gas to get there. NICE! 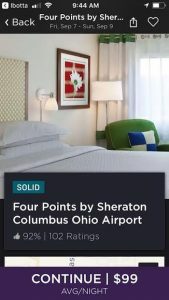 Out of curiosity, I checked out Columbus, Ohio destinations on Hotel Tonight. My son absolutely loves Ohio State football and I’d love to take him to a game in “the Shoe” someday. Four Points by Sheraton had a great offer of $198 for the two nights, and it’s only 10 minutes from the stadium! The Hoel Tonight Ibotta offer was 3% cash back which equals $6. Every little bit adds up! And the, I wondered how my friends might save on their beach escape. I searched the Intercontinental Hotels brand at Orange Beach, Alabama (one of my very favorite beaches). They are offering 10% cash back on bookings right now, so those wanting to hold on to summer just a little longer could get up to $48.12 cash back on a trip they’re planning to take anyway! Oh my goodness, why did I wait so long to join Ibotta? As summer ends and the reality of back to school routines sink in, why not reward yourself with cash back from Ibotta? As you can see, getting cash back with Ibotta is easy! Don’t wait like I did. 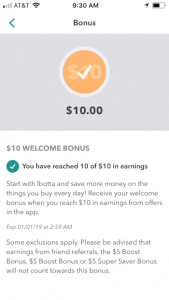 Download the free Ibotta app and start earning cash back today.